Working Abroad panel, left to right; Charlotte Morgan (1969), Niels Kroninger (1996), Judith Buttigieg (1988) and Adam Alvarez (1998). On 24th January 2017 the City Group met at the offices of Smith & Williamson in Moorgate to discuss the challenges and opportunities of an international career. 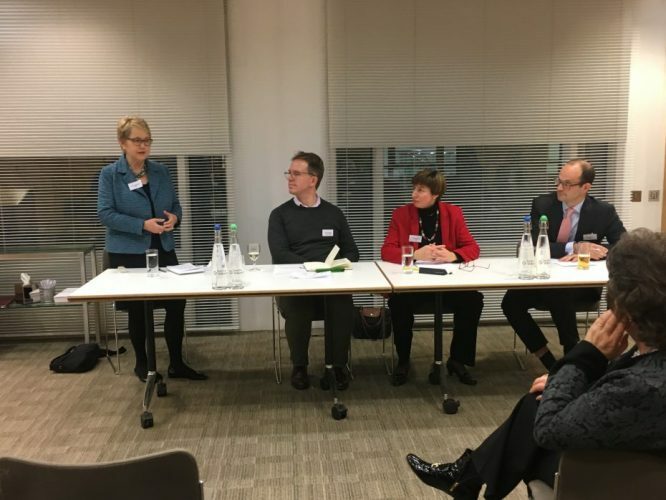 The event was led by a panel of Somervillians and was kindly hosted by Somervillian and Smith & Williamson partner Helen Demuth. The topic had been prompted partly by concerns in the City that Brexit would cause some businesses to move roles outside the UK; but we found that City careers are involving international assignments for many reasons. The audience were very interested to discuss and share the challenges this can present, as well as the many advantages both personally and for their careers. A common theme was that working internationally becomes a particular challenge once children reach school age. In some cases this had prompted people to return to the UK, although it was encouraging to hear from Somervillians whose parents had worked internationally when they were growing up that they had enjoyed the international lifestyle, and that moving between countries and schools had not held them back. All the panel agreed that their work overseas had been enjoyable and had helped their careers. Adam Alvarez (1998) who moved to Bermuda at short notice to help found a new office for the insurer Hiscox, and after more than 10 years in Bermuda returned to the UK to found his own business where his clients include Marsh and McKinsey. chaired by Charlotte Morgan (1969) who has managed international teams at Standard Chartered and ED&F Man, and is currently a NED at Ford Credit. The meeting closed with advice from Inez Anderson, partner in business tax at Smith & Williamson, on the importance of considering tax liabilities when employees move from place to place, along with some of her personal war stories from travels with her many international clients. 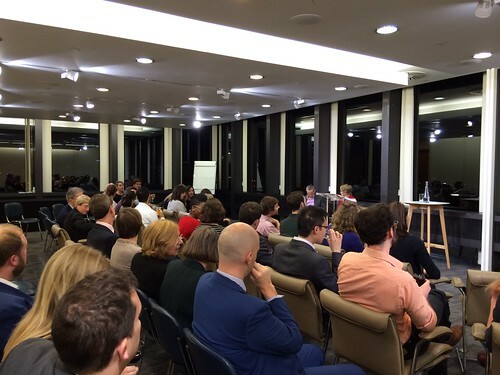 A Somerville City Group Event was held on Monday, 16th November, at the Aviva HQ in London. The City Group enjoyed a fascinating and thought provoking talk by economist and regulator, John Fingleton, in the splendid 24th floor meeting rooms of Aviva HQ in Bishopsgate. Having headed up both the OFT and the Irish Competition Authority John offered a unique insight into the impact of disruptive technology on diverse business models. John’s talk took us back to the innovative nineteenth century owners of hackney carriages, who leased them out to help cover costs through to EBay and Airbnb. He challenged the popular understanding of the term disruptive – does Uber’s activity actually meet the definition? He also debated how effective or otherwise the interventions by the authorities have been, citing London boroughs’ attempts to restrict the operation of Airbnb during the Olympics and the challenge of regulating to encourage Uber services for wheelchair users in London. It was fascinating to learn that the biggest boost to technological innovation comes from government spending most notably on behalf of the US and Israel. He felt regulators needed to improve their understanding of technology and market trends, and that they are sometimes too slow to relax the rules. Ultimately merger thresholds may be too low in relation to innovative tech businesses. 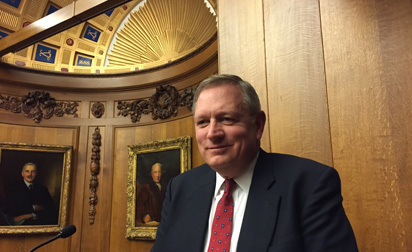 Members of the City Group and their guests had the privilege in February 2015 to visit Richard Rogers’ splendid Lloyd’s of London building for a talk in the Old Library, given by Lloyd’s Director of Performance Management Tom Bolt (above) – a leading expert on the insurance industry and member of Somerville’s Development Board. The Old Library is a beautifully panelled room which was preserved from the Lloyd’s 1928 building and contains portraits of Lloyd’s chairmen since it was founded. The topic for the evening was Cybercrime, which is not only a major concern to individuals and businesses across the globe, but also a challenge to the insurance industry. Tom stressed the importance to Lloyd’s of underwriters being in a position to quantify potential cybercrime losses, and hence price risk and provision appropriately: he used different types of virtual currency (e.g. Bitcoin) to give examples of where apparently similar cyber risks may in fact have markedly different exposure levels, to the extent that some can be insured at the moment while others cannot. He also explained how Lloyd’s monitors the performance and risk profiles of the syndicates to ensure their liquidity and ability to meet claims is sustained. Tom answered a wide range of questions from the audience. He ended with some cautionary advice on the extent of unreported hacking – particularly of mobiles – and the importance of secure passwords, as well as highlighting the role of Government and policymakers in addressing Cybercrime. The audience included some judges working on City crime cases, many recent Somervillians starting their careers in business and law, and guests from the insurance world – so as usual the meeting provided a great opportunity for networking and catching up with friends, as well as learning about this fast moving and fascinating world from a real expert. Somerville alumni’s City Group gathered at Selfridge’s, London on 8 October to preview Peter Pilotto‘s new collection, try them on and consider a seasonal purchase. Becca-Jane Schofield (2009, Ancient History) reported back. 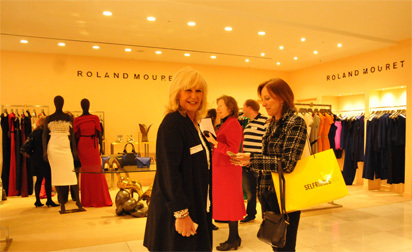 From the first moment of being ushered into the glamorous surroundings of the Selfridge’s Personal Shopping lounge, and furnished with cocktails, it was clear the Somerville alumni event with Peter Pilotto was destined to be a rousing success. I can think of no better way to spend a rainy Wednesday evening than sipping on Caprinhas and Prosecco as models circulate in beautiful clothes and the designers themselves mingle happily! The clothes themselves were beautiful. Showing off the distinctive prints that make Peter Pilotto designs so unique, this was an unrivalled chance to examine up close the design details and expert embroidery utilised by Pilotto throughout the collection. Bright colours and intricate prints provided a complement to classically elegant shapes, as hybrid materials such as lace against neoprene made a dramatic yet feminine statement. With cinched waists drawn in by bright ribbons against honeycomb-inspired designs and fit-and-flare shaped dresses, this collection was designed to create a feminine and flattering shape on every woman. Stand out pieces were a full length printed dress combining bright greens and yellows with feminine prints, and a satin graphic-printed coat. With the blurred knits from the Fall/Winter 2014-15 collection making a transition into this Spring collection, these classically tailored pieces will bring a bright splash into a grey English springtime, whilst the delicate embroidery, bright lace and intricate patterning ensures classic style with a modern twist. Minimal styling or make-up is required, as seen on the models; these clothes speak volumes for themselves. And how wonderful to have seen some trend-setting Somervillians trying on clothes! A personal favourite was the combination of a classic white blouse with an overlay of bright neon lace paired with a brightly patterned neoprene skirt seen on one particularly stylish Law graduate. Designers Christopher de Vos and Peter Pilotto mingled happily and spoke warmly of their love for London, having recently shown their S/S15 collection at London Fashion Week. Thanks must of course go again to Selfridges and Duncan McRae of Flying Colours for providing us with this opportunity, and to the Peter Pilotto team for allowing us to see the collection up close before it hits the shops! Those in search of Somerville City Network members on the evening of Wednesday 5 March, 2014 would have found them ankles deep in spikes, sparkles and stilettos – and enjoying every minute of it – at the Christian Louboutin boutique on Mount Street. Hosted by Louboutin, the French accessories label with the inimitable red soles, and Duncan McRae of Flying Colours, the evening was a welcome respite from round-the-clock meetings and sleep-depriving deals. Guests had plenty of opportunity to mingle and socialise, enjoy pampering foot treatments from Margaret Dabbs, snack on canapés, sip champagne and, of course, try on the head-turning footwear on offer. Pastels, slingbacks, patent and PVC and artwork-inspired creations are all big when it comes to Spring 2014 shoe trends. There was a prize draw for a signature pair of Louboutin Pigalle 120mm stilettos – won by a gentleman, to everyone’s envy and amusement – and party-goers took home lovely goody bags with printed Louboutin scarves and a Margaret Dabbs foot lotion. With guests like Baroness Lucy Neville-Rolfe and her daughter in law, Jen Barton, Esther Rantzen and her daughter Rebecca, and New York media entrepreneur Cindy Gallop, the evening was proof (yet again!) that Somervillians know how to combine substance and style. In November 2013 the City Group held a meeting to discuss Non-Executive Directors – Who? What? How? at 1 Poultry, the office of Aviva Investors. Increasing focus on corporate governance, and demands for more diversity, are creating opportunities at all levels for new NEDs. A panel with broad experience in this field discussed what makes a good NED and how to become one. 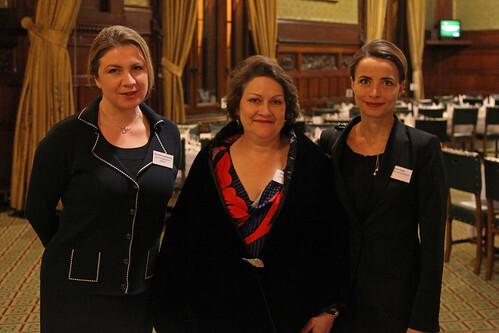 The panel comprised three Somerville alumni who are non-executive directors in a wide range of businesses – Baroness Neville Rolfe, Melanie Gee, and Alexandra Mackesy ; alumna Krystyna Nowak, who is the Managing Director of Norman Broadbent’s Board and Financial Services Practice, who commented on changes in the role of NEDs over recent years; and the corporate governance advisor at Aviva Investors, Anita Skipper , who gave an update on the changing expectations of shareholders. The panel was chaired by Charlotte Morgan. Somervillians enjoyed networking drinks and further discussion with the speakers in Aviva Investors’ reception rooms with stupendous views over Royal Exchange and the Mansion House. 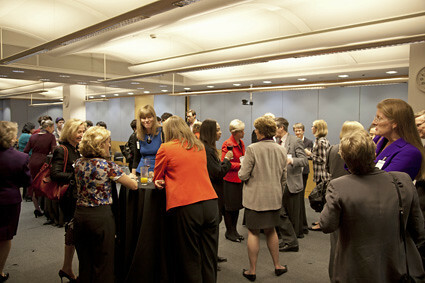 A Somerville City Group event was held on 18 March 2013 at the Lloyd’s of London building. The speaker was Sir Hector Sants, who discussed what the financial crisis tells us about how professionals in the financial services should behave. The meeting was hosted by Tom Bolt, who is Director, Performance Management at Lloyd’s, and a member of Somerville’s Development Board. Sir Hector, who was Chief Executive Officer of the Financial Services Authority from 2007 to 2012, and is now Head of Compliance at Barclays Bank, has an unparalleled perspective on the challenges facing the UK financial community. The meeting took place in the Old Library, a memorable venue with oak panels and impressive hand-carvings of 17th and 18thsailing vessels.